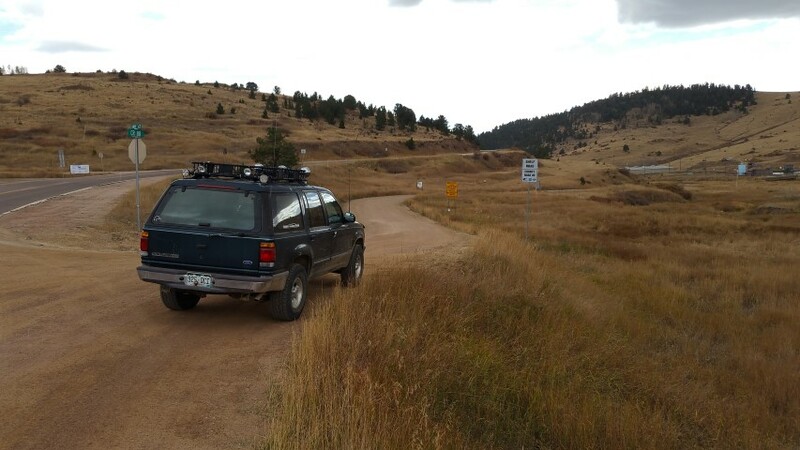 Shelf Road dates back to 1892, a time when a route was needed from the Arkansas Valley to the Cripple Creek Mining District. It was cut into the side of a sheer canyon wall on the Southern end, which is the reason for its namesake. It was originally used as a stagecoach and freight route. "The horses snorted and coach lurched and slipped as we struggled out of deep mudholes; and once.......the lead team had to be unhitched to get around a sharp bend." 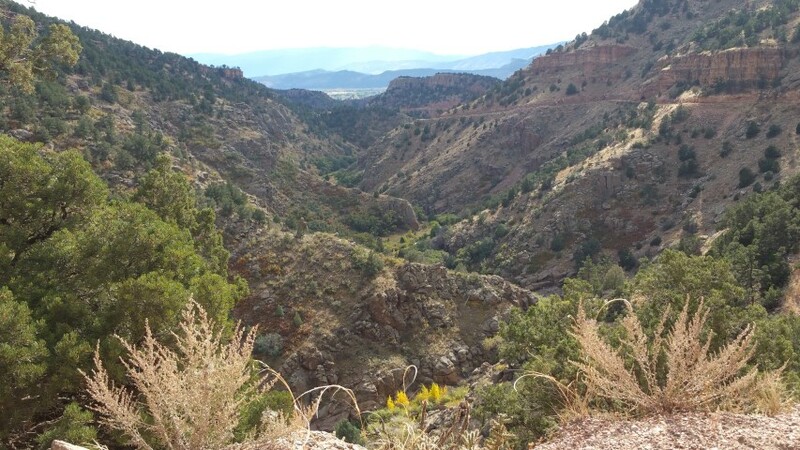 ~Mabel Barbee Lee~ The road features some incredible views, sheer limestone formations, including Window Rock, a hole through a granodiorite formation where Rocky Mountain Bighorn Sheep frequent. Heart pumping drop offs abound on what is a single width road in some areas. There is plenty of dispersed camping throughout with some of the most challenging rock climbing in the world, and plenty of breathtaking views of the valley floor as well as into the distant mountains to the South. Two ghost towns are along the trail, Mound City and Marigold. Stone foundations of what was once a gold processing mill can still be seen at the Mound City site. Anything that still remains of Marigold is now on private property and not accessible. 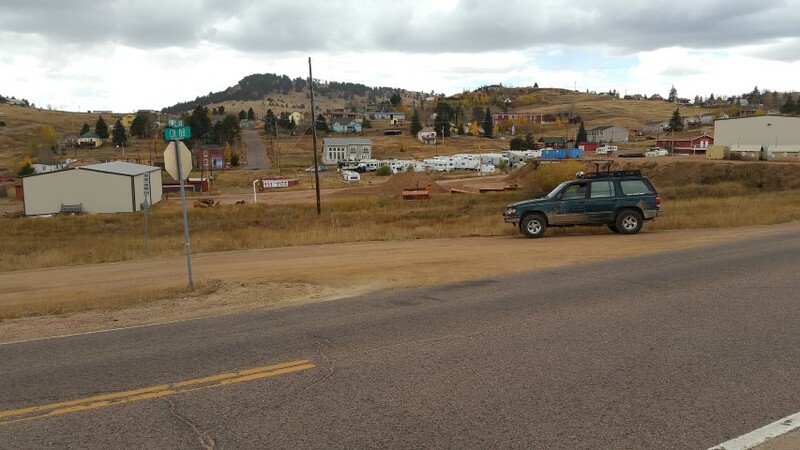 The Trailhead from the Town of Cripple Creek side. Want to see 5 more waypoints? Become an All-Access member! From Manitou Springs, CO. head west on US Hwy 24 for 20.5 miles. 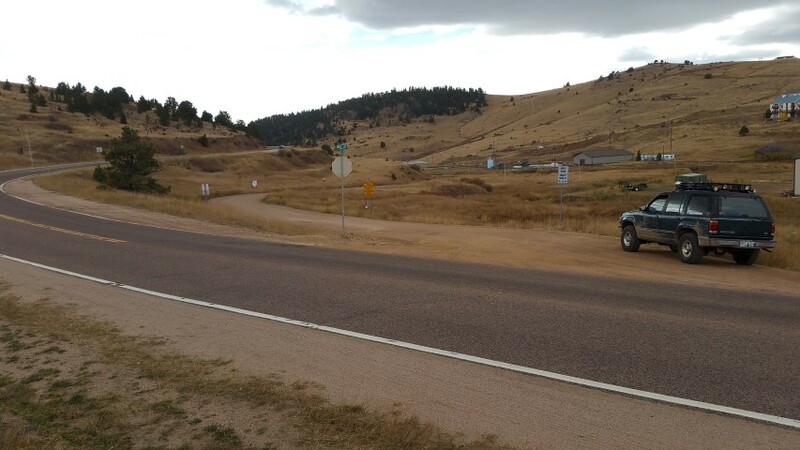 Turn left onto Colorado Hwy 67 and continue for 18.5 miles to the town of Cripple Creek where Colorado HWY 67 becomes East Bennet Ave. Proceed 3 blocks to the stop sign at 2nd St. and turn left. Continue 0.3 miles to Xenia St. / County Road 88 and turn right. You are now on the beginning of Shelf Road. To reach the road from Cañon City, head North on Field Ave. from US HWY 50 for 3 miles until it comes to a "T" at Red Canyon Rd. and turn right. Red Canyon Rd. quickly becomes Garden Park Rd. and you will continue for 9.7 miles where Garden Park Rd. becomes Shelf Rd. Was on my way to to work this morning and there was a few rocks in the road on the stretch of the shelf. As I got to the County Line where Four Mile Creek goes under the road, Four Mile Creek was actually going over the road where the concrete is at. With all the heavy rains every night there is a lot of water. There was debris of trees and branches from a heavier flow last week. The water was not very deep and not flowing very fast. 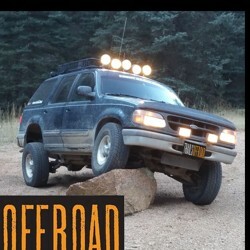 The teller County part of Shelf Road does have standing water in some parts of the road. The road is rough and washed out in places. If you you are going up and have to move over due to another vehicle coming down I would advise being very cautious when getting near the edge of the road as it will be very soft with all the rain that we have had. I travel this road everyday to and from work year round. 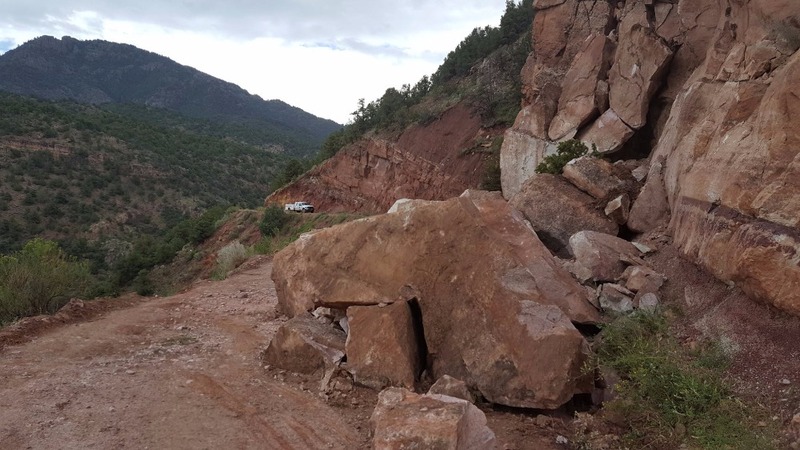 After a recent rockslide, Freemont County has announced that the road is now open again as of yesterday. Picture Courtesy of Freemont County. We drove up from Canon City starting about an hour before sunset, and had just enough time to get to Cripple Creek by dusk. Above the beginning of the shelf road, we only met a few other vehicles, all heading down. A couple of cars that had started up ahead of us turned around. There were massive flocks of turkey to be seen in the lower elevations. There's a private residence near the top, above the mine pictured in the guide, and just above the drive to it, there's a shaded uphill section that's muddy from snowmelt, and could still be icy if temperatures are right. Had no issues though; still on winter tires. If you drive up like we did, note that the shelf road from which this route gets its name is on the driver's side of the canyon, which puts the passenger in the sky seat... my copilot is still learning to trust me and the vehicle, so keep that in mind if you have slightly nervous passengers. Great write up, and made for a nice excursion. We'll go back another day when we have more time to stop and explore.